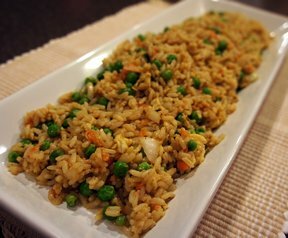 Leftover rice is perfect and actually works out the best in fried rice recipes. 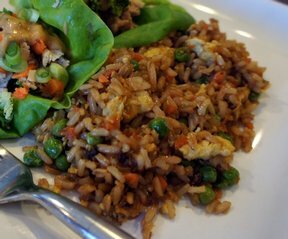 The vegetables add color and flavor and the soy sauce adds just the right touch of seasoning. Put a wok or electric skillet on high heat. Add oil to pan. Whisk eggs in small bowl. Put the eggs in the heated pan and scramble very quickly. Stop heat and remove the scrambled eggs from pan into dish. Add more oil. SautÃ© vegetables and meat until softened. Add garlic salt, chicken bouillon and rice; stir well. Add the scrambled eggs and mix together. Turn heat down to low, add soy sauce, and stir quickly. 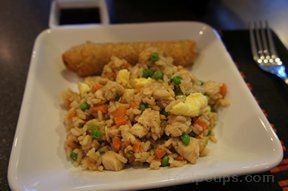 "I'm always looking to create the fried rice from my favorite Chinese restaurant and this is the closest I have come. The trick must be the chicken bouillon. 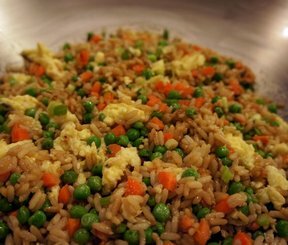 Really good fried rice!"